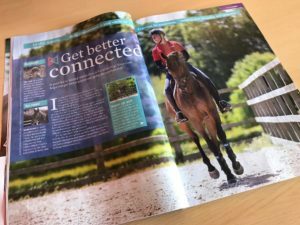 We’ve partnered with Horse & Rider Magazine to bring you a training series with RED MILLS eventing brand ambassador Tina Cook. Born into horses, Tina has a wealth of experience at major championships. As a mainstay of the British team she’s won three Olympic medals, three World Championship medals, five team European Championship medals and was European Champion in 2009! The first of the three-part series with Horse & Rider focuses on exercises to get your horse better engaged and connected. Establishing engagement is an important factor to get your horse working comfortably and correctly but it can be easier said than done, especially with young or inexperienced horses and ex-racehorses coming out of training. The article includes helpful information on building engagement in your warm, exercises to aid suppleness plus polework ideas to give your schooling a refresh. It’s packed full of top tips to help you at home.